Vocalist Pete Godfrey and drummer Pete Newdeck had been members of In Faith who released an album in 2014 called “There’s A Storm Coming” (http://www.rockradioni.co.uk/back-stage/music-reviews/1697-ni-rocks-recommends-qtheres-a-storm-comingq-by-in-faith.html ). The latter had also been a member of Eden’s Curse and is also the vocalist for Tainted Nation. Bass player Rob Naylor had been a member of Angels or Kings (http://www.rockradioni.co.uk/back-stage/music-reviews/1704-ni-rocks-recommends-qkings-of-nowhereq-by-angels-or-kings.html ). Lee Revill had been a guitar teacher for many years and had been in the Gary Hughes band, whilst keyboard player Irvin Parratt had been in bands such as Lost Weekend and Rage of Angels. NI ROCKS – Hi Pete. Thanks for taking some time to talk to Rock Radio NI. I wanted to talk of course about the new album that your band Blood Red Saints released on 4th December. First of all though tell us a little about the band. When did you form and who else is in the band with you? PETE – We formed around this time last year. Me and Pete Newdeck were in In Faith and Rob Naylor was in Angels or Kings. In October we met up at the Firefest Festival. Me and Rob had known each other off and on for quite a long time; 20 odd years. We just decided we were going to write; with the intention of writing for other people to be honest. But you know how it goes; you start writing and go we’ll keep this one and we’ll keep that one and pretty soon we’ve about five songs and we’re thinking we’re going to have to do something here! So we made a conscious decision that we were going to record an album-worth of stuff and see where it went. Pete is good on the producing and mixing so we drafted him in; not really with the intention of having a band sort of thing at that point. We needed a guitar and Lee Revill was the name that kept coming up to be honest, with everybody. He’s been a guitar teacher for 20 odd years; that’s his occupation, so he’s good and he’s done it all. He played with Gary Hughes back in the day and stuff like that but hadn’t been in an originals band for 15 - 20 years. We met up with him and that was like the catalyst; that was the bit that kicked it all in. We were thinking this is where we want to be and decided we were going to do it as a band. We got Pete involved; we kinda press-ganged him into it and we did the album from there. That was the way it panned out really. In the past couple of months we’ve added a keyboard player, Irvin Parratt, who was with Lost Weekend and Rage of Angels. The band is complete now, but that was how it worked in a nutshell! 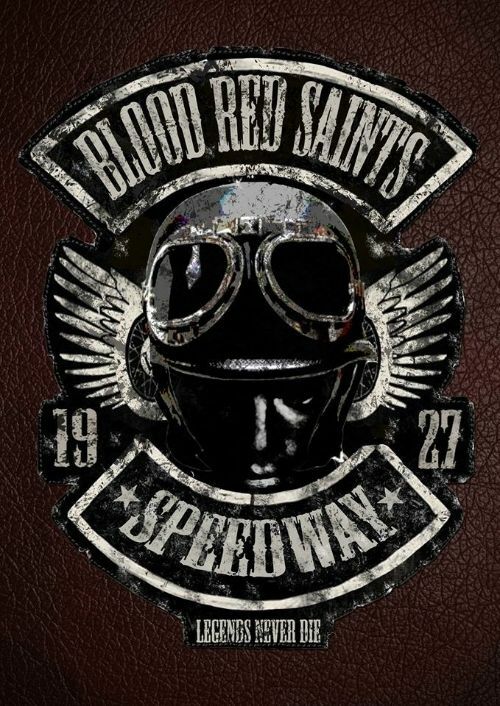 NI ROCKS – Blood Red Saints is a great name for a band. Reading the press release, I believe that it comes from an American speedway team during the 1920s. Two questions connected to that. Firstly, what is the story of the original Blood Red Saints and how did you become aware of it? PETE – Google, if you want the truth! (Laughs). There is very little written about it. We’ve embellished it to make it more romantic than it really is. Apparently there was a team called Blood Red Saints and the name instantly registered with us. We to’ed and fro’ed over it for a couple of weeks thinking it was maybe too heavy for us, because we’re like melodic rock, but we couldn’t find anything else. There was nothing else that compared. So we decided to run with it. We put the name out to some people and no-one flinched and said “oh you’ve gone metal”! So we went with that. There was a guy called Freddie Rendetti, who did apparently exist, but we turned him into a world champion. It was one of them sorta things. The only mistake we made was that we killed him off so we’ve problems for the second album! We’ll have to start again now. We just decided to theme everything around it. Each to their own. I’m all for crosses and skulls and stuff like that but everyone has done it. We just thought this is a different angle and it has sorta worked so far. We even had an interview with “Speedway Star” magazine which is bizarre! NI ROCKS – So did the album title “Speedway” and the track “Kickin Up Dust” come first or did they get inspired by the band name? PETE – “Kickin Up Dust” was the last song written for the album. We’d gone down this road and designed the artwork and had the back story in place. We didn’t want to do a concept album; we aren’t that grand or pompous, but we needed something and we also needed an album opener and it just fell into place. Rob came up with the idea of doing the old fashioned microphone voice and stuff like that. It just seemed to work and that literally was the last song written on the album. NI ROCKS – The album is released through Frontiers Records. I believe James Martin of Vega was involved there. What is the story behind that? PETE – I met James, again at Firefest, last year and he suggested writing songs. It was that period when we wanting to write with anybody and we wrote a couple of songs with James and Tom. “Best of Me” on the album is one of those songs. We became friends and I knew Vega were signed to Frontiers and he said if we can ever help just give us a shout! So I called it in and to be fair he got in touch with Serafino and it was done and dusted. Serafino said he’d listen and came back and said it was great; so I’ve a lot to thank James for really. NI ROCKS – We’re going to play a track from the album now. Do you want to pick one and maybe tell us a little about it? NI ROCKS – The album “Speedway” was released on 4th December. Where was it recorded and who did you work with? PETE – We recorded it all in our own home studios. Pete has a better studio than any of us so we did quite a lot of the final mixing there. Pete Newdeck has been in charge of it all – he’s produced, mixed and engineered it. We’d all send our parts. It’s bizarre really. It’s not the way I ever imagined recording. I always thought you’d all stand together and say let’s jam this and see how it goes! Because Pete was down south from us it was logistically hard to get together in the same room. It was a case of going to and fro. Sending things by e-mail or Dropbox and working that way. Pete would send a rough mix and we’d make a few changes. We were rarely in the same room until we were on final mixes. The connection then through Pete and In Faith was to get Harry Hess to master it again. We have a song called “Faith” which is the last track on the album and Pete knew that Harry was a classically trained pianist and suggested that he put something down on it. So we had Harry Hess in the band for one song! NI ROCKS – That brings me nicely to the next question. You’d also worked with Harry Hess on the album that you released with In Faith in 2014. Was there a firm intention to work with him again on “Speedway”? PETE – Yeah, pretty much. I was happy with the way that the In Faith album came out. It was a strong album and I thought the sound was great. It was a case of why fix it if it ain’t broke, so we approached Harry and he was up for doing it. He does a great job. He listens to what you want and he knows his stuff. It was a no-brainer really. NI ROCKS – He’s a very talented guy. In terms of song writing - were all the band involved or was there a core group responsible for writing the songs? PETE – I had a few that had been written before we started off, but to be honest apart from a song called “The Best Thing” which is just mine and just as it was, everything else involved the four of us that recorded the album. It was a case of “what about if we try this” and everything was chopped and changed. So even if I came up with the original idea, Lee would bring a guitar part that would change the direction or Rob would re-write words and Pete would throw parts in. It was a band effort, but “Kickin Up Dust” was the first song that we wrote from scratch as a band. The more you know each other, the more you develop, the more you know how somebody works, the second album will be even more of a band effort. NI ROCKS – Blood Red Saints drummer Pete Newdeck was also a member of In Faith. The band released an album called “There’s a Storm Coming” back in October 2014. Do you envisage there being any further releases from In Faith or has that band had it’s day? PETE – Not with me, no. I suppose you never say never but as far as I’m concerned there won’t be another one. I can’t speak for Pete or Tony, but not involving me. This is the focus now! NI ROCKS – Which leads nicely onto my next question. Your focus is obviously very much on Blood Red Saints at the moment then. Are there plans to get the band out on the road? PETE – Yeah, we’re playing tomorrow for the launch show. We’re doing a charity show with about 6 other bands at the end of January – Nigel Bailey’s Lifeline, Hand of Dimes, Fahran (No Hot Ashes and Newman). We’re talking to a band about a tour in April, but it’s not confirmed so I can’t say anything yet. We’re doing Hard Rock Hell AOR in March and the Frontiers Festival. But the problem is that because we’ve got no history and nobody knows what we sound like, we can’t really approach anybody. Until the album is out and people are aware; for example the other festivals that we’d like to play – Vasby and that sort of thing – until you’ve got something behind you then it’s difficult. We’re going to try and play as much as we can. NI ROCKS – You’re heading to Italy for the Frontiers Festival then? PETE – Yeah, we open the Sunday (24th April). We’re definitely doing that and it should be good. There’s a few good singers that Sunday so I’m going to have to up my game (laughs) – there’s Nathan James (Inglorious) Terry Brock and Paul Laine (The Defiants)! I might not turn up! (laughs). NI ROCKS – We’ll play another track from “Speedway” now. Again do you want to pick one and tell us a little about it? PETE – We could go with “Dangerous”. This is Rob Naylor’s favourite track. He thinks this song epitomises the band the best. It’s our take on kids who have grown up playing games consoles and thinking that war and killing is easy. They can turn the game off and start again, but obviously in real life it doesn’t work that way. We’ve become desensitised, that’s pretty much the story behind “Dangerous”. NI ROCKS – Reading the press release, there’s a quote from you saying that there are elements of Bon Jovi, Def Leppard, Winger and FM in the Blood Red Saints sound. Are those the bands that you would say influenced you musically? PETE – Yeah, I’d go with all those. I think the obvious connotation is because we’re melodic rock. I’ve always loved FM, so that’s a given. I wish I could sing like Steve. Bon Jovi – I’d take that every day – when they were at their power they were the band to beat. Personally I’d go the Bon Jovi route, but we’ll see where we go with the next album. I love Winger and I think Lee has a similar-ish style to Reb Beach. I cna see it, but I can see Def Leppard in us as well. We take our influence from any of those sort of 80’s and early 90’s bands to be honest because that’s where we’re from. To be mentioned in any of those circles; that you sound a bit like Bon Jovi. I’ll have that every day! NI ROCKS – What bands do you listen to yourself these days? PETE – I don’t listen to very much to be honest. I like H.E.A.T. and I think Degreed are good. Obviously Nathan James (Inglorious) can sing the hind legs off a donkey, but I stay away from him because he frightens me to death (laughs). There’s a lot of good bands isn’t there. Nigel Bailey’s Lifeline. We do seem to be at a point where the bands have upped their game. I’m not talking out turn, but for a few years I don’t think there was anything, but now it seems that everybody is coming up with good stuff. There’s a lot of good stuff. Scandinavian bands seem to have the market. NI ROCKS – Yeah, half the stuff I get sent seems to be Swedish. PETE – Yeah, but in fairness to them, they do it well. You can’t fault them. I don’t listen to any old stuff to be honest. I’d harp back to Bon Jovi’s “New Jersey” and “Slippery When Wet”, Winger’s early albums, those sort of things. I would still listen to those out of choice, but there is a fair few new bands coming up and you got to give them their due. NI ROCKS – I’d spoken to Nigel Bailey earlier this year, just after his Bailey album had come out about this time last year. ( http://www.rockradioni.co.uk/interviews/1812-ni-rocks-interview-with-nigel-bailey-three-lions-a-bailey.html ) And now the Lifeline album which is a more recent one, but they’re both good albums. PETE – Yeah, he’s a great lad who deserves his shot and he’s working hard at it. I can’t wait to hear what he comes up with next to be honest. NI ROCKS – On a similar vein. Can you remember the first gig you went to and the last one? And first album you bought and the last one? PETE – First gig, that’s a good one, and the answer would be I don’t have a clue! Probably ‘82 or ’83. I’m not sure. It was the Motley Crue and Cheap Trick kinda period – all those type of bands. I saw Bon Jovi support Kiss. That’s about where I started. First rock album? Rob lit on me the other day when I said that I originally liked bands like Queen and ELO, but the first rock album I bought was....and he said so you don’t class Queen as rock!! And I thought yeah, fair point! Kiss was the first band that I thought, yeah that’s what I want to do. Last gig was Rockingham this year. Me and Pete played with Issa in her band and saw all the bands at Rockingham. The two Firefests before that were the last shows I saw to be honest. NI ROCKS – We’re nearly at the end of 2015. 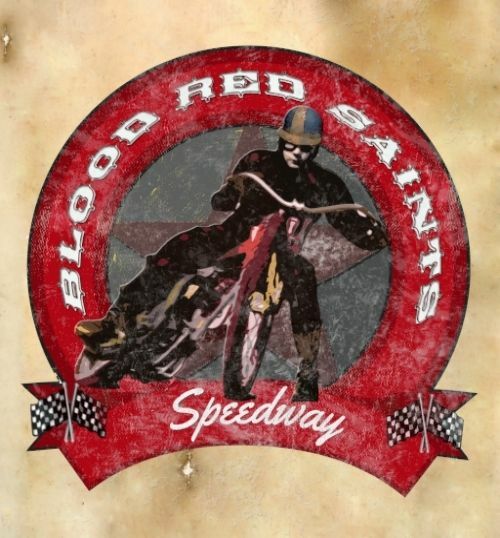 Looking ahead into 2016, what would you hope to have achieved with Blood Red Saints by this time next year? PETE – Definitely another album. We’re four sings into another album and we’ll do our level best to get it out late September or early October. The problem is that you can’t go out on your own with one album, you’ve just not got the material. So we’d like to have a bigger catalogue so we could potentially go out and play without being a support. We just want to get out and play live, hopefully until about May. Get going, get our chops together and get used it used to and see what comes from that. At the same time, keep writing and hopefully, come May or June, record it and get it out for October. That’s the plan. NI ROCKS – Are there any other projects that you’re involved in or planning for apart from Blood Red Saints at the minute? PETE – I’ve written with Rob and Pete for an un-named singer shall we say. There should be a couple of songs on an album next April or May, which will be quite a nice little thing for us if it happens. There’s a couple of things that have come in from Frontiers but nothing that is confirmed yet. But at the end of the day, this is the focus. We’re all getting on, so it’s a case of lets batter this as much as we can for the next 3 or 4 years maybe and see where we go. There are other things and if they come off, they’ll be great but they’re in the planning stages at the moment. NI ROCKS – That’s all the questions that I have. Thanks very much for taking the time to talk to me. We’ll finish with another track from the album “Speedway”. Which one would you like to play and why? PETE – I think we’ve gotta go with “Kickin Up Dust” because that’s the song that defines us at the moment I’d say. That’s where we’re strongest, personally I think. “Kickin Up Dust” - a bit of Freddie Rendetti and the Blood Red Saints!